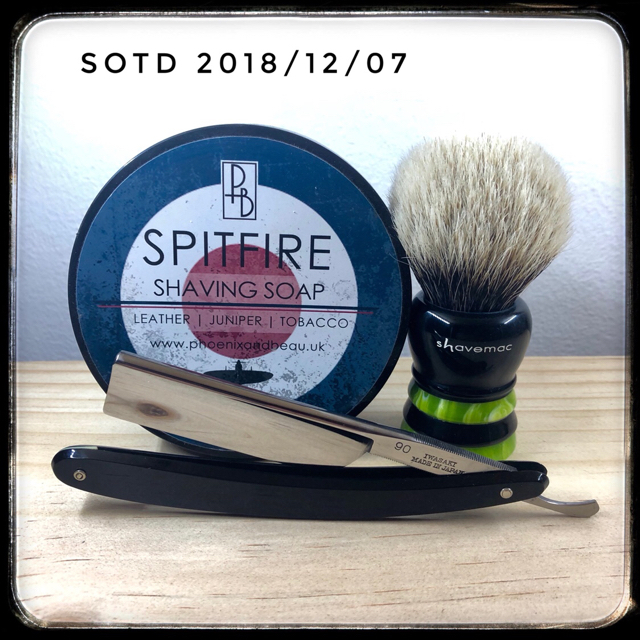 Tell us about your SOTD - was it BBS? Great shaves @Thug, JHB, Clouds! @Thug The Stirling menthol soaps - even the non Glacial ones are very cold, in fact they’re colder than any other soaps from other companies. @JHB Dagga or Daga seems to have several different meanings. It’s confusing! A pretty lekker shave all in all. The Lemon Ice soap from Mama Bear gave me very good lather and although the scent is not too lemony it’s still nice. I felt the menthol effect, especially during my second pass. The Prep sure felt fantastic and the Bergamot Vetiver aftershave stung like crazy but then it felt icy cold and soothing. My wife thinks it smells great. I’d rate this shave almost, but not quite a BBS. JAYDEE wrote: A pretty lekker shave all in all. The Lemon Ice soap from Mama Bear gave me very good lather and although the scent is not too lemony it’s still nice. I felt the menthol effect, especially during my second pass. The Prep sure felt fantastic and the Bergamot Vetiver aftershave stung like crazy but then it felt icy cold and soothing. My wife thinks it smells great. I’d rate this shave almost, but not quite a BBS. This soap is indeed good but take my word for it - your soaps, and every other South African soap is much better. Except for a few, I’m not a big fan of glycerin soaps and I find that Mama Bear has a fault which could be a little serious because there’s a lack in skincare compared to let’s say, Reitzer. I had to use twice as much Prep to relieve the dryness. I’ll use this one up but I doubt that I’ll buy it again. A shave to honour Mr Stanley Spiegelman z”l, the late and dearly beloved Dad of Jason Spiegelman, a friend of mine who runs the Shave Market on Facebook. Stanley loved Old Spice stuff. May his memory be a blessing and an inspiration for his family. Great tribute shave Jeff! Condolences. Outstanding shave! Smooth as silk! As we begin the school holidays here in South Africa, a reminder to always keep your blades safely stored, and out of reach of the little ones. Take care, stay safe and keep on shaving! Awesome shaves @Clouds, Mo, Thug! JAYDEE wrote: Awesome shaves @Clouds, Mo, Thug! Smooth as smooth could be and very comfortable. I really enjoyed this shave with the Old Spice cream which I bought several years ago and had almost forgotten that I had it until I was invited to participate in this event. The Fino balm was so moisturizing as well as soothing and the Old Spice aftershave, together with the cologne finished everything off. JAYDEE wrote: Smooth as smooth could be and very comfortable. I really enjoyed this shave with the Old Spice cream which I bought several years ago and had almost forgotten that I had it until I was invited to participate in this event. The Fino balm was so moisturizing as well as soothing and the Old Spice aftershave, together with the cologne finished everything off. We definitely need to restock the old spice cream. I must speak to our contact in India. It’s a fantastic cream @Mo. I always loved it. What a pity that it’s so hard to find now. Fantastic shaves this week gents! Two shaves to post today. Both were extremely smooth and close. The British Aristocrat razor was just a joy to use. Light touch mowing through the growth. This razor has quite a bit of blade exposure compared to the Super Speed but is as smooth. The added aggression means less strokes are ultimately needed for a DFS. One of the reasons it is one of my most used and prized Gillette razors. Normal post shave routine followed for both shaves. Just changing out the aftershave splashes and balms. Face feel was superb. The balms replenishing the skin very well. Wishing you all well for the weekend! Awesome shave Clouds! What other blades have you tried in the Gibbs razor?